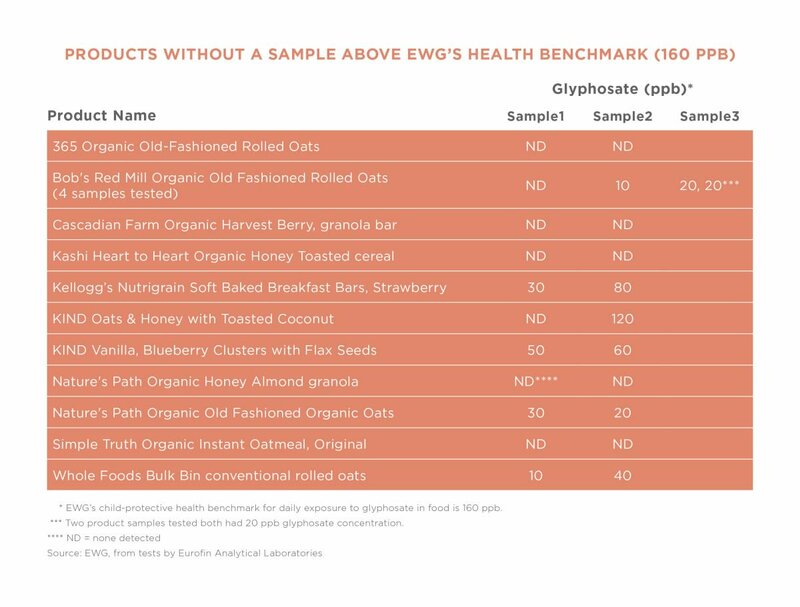 31 out of 45 foods containing conventionally grown oats had glyphosate levels greater than the Environmental Working Group's healthy benchmark, according to a new EWG study. Glyphosate is having a rough month. Last week, the Environmental Working Group (EWG) released a study conducted by an independent third-party lab that found the herbicide was present in 95 percent of breakfast foods made with conventionally grown oats, and 31 percent of samples made with organic oats. The active ingredient in the popular weedkiller Roundup, glyphosate is a contentious chemical. Earlier in August, a San Francisco jury told Roundup manufacturer Monsanto to award $289 million in damages to a man who claims he developed cancer after repeatedly spraying large quantities of Roundup while working as a school groundskeeper. And both the World Health Organization's International Agency for Research on Cancer and California's Office of Environmental Health Hazard Assessment (OEHHA) have linked glyphosate to cancer. The EWG argues that current glyphosate exposure safety levels of 70 milligrams per day set by the Environmental Protection Agency and California's 1.1 milligrams per day are too high, and that the threshold should fall closer to 0.01 milligrams per day. "Because children and developing fetuses have increased susceptibility to carcinogens, the federal Food Quality Protection Act supports including an additional 10-fold margin of safety," writes toxicologist Alexis Temkin, PhD, in the EWG report. "With this additional children’s health safety factor, EWG calculated that a one-in-a-million cancer risk would be posed by ingestion of 0.01 milligrams of glyphosate per day." The EWG adds that one would only have to eat a single 60-gram serving of cereal (about 1/2 cup) with a glyphosate level of 160 parts per billion (ppb) to go over their set daily maximum. 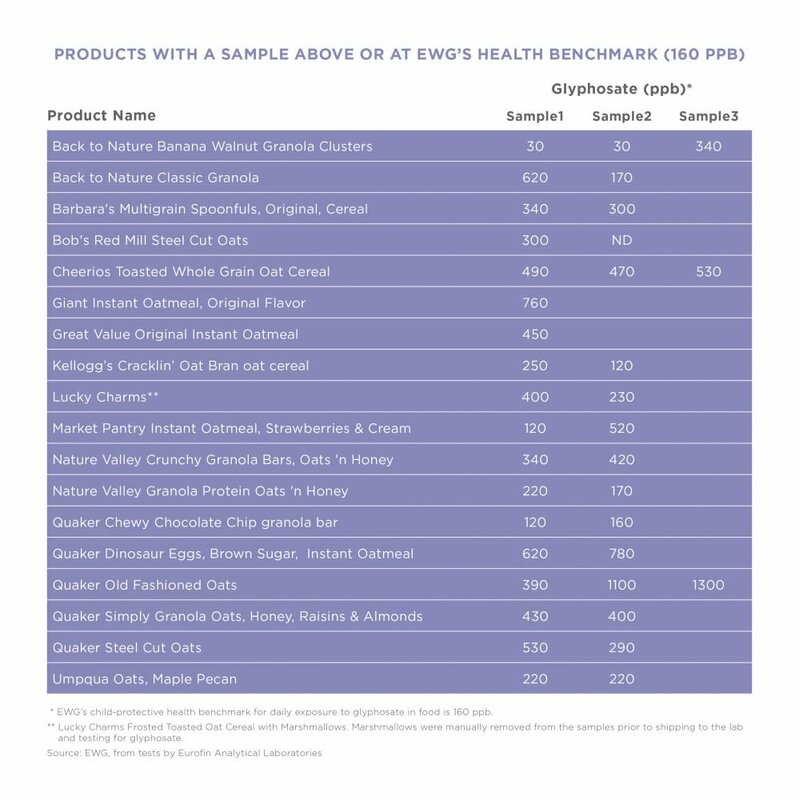 Unfortunately, many cereal samples tested by the EWG had greater glyphosate levels. Find below an infographic showing the products tested by the EWG to learn which samples contained the most—and the least—amount of glyphosate.